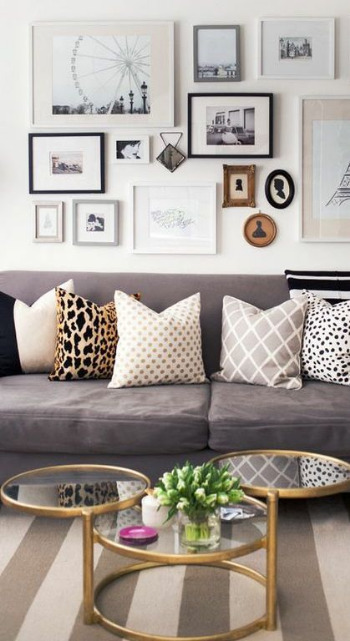 Being that sofas are pricey and I’m assuming you already own one, a good way to give your sofa a makeover is to add a few decorative pillows. I love printed pillows mixed with different textures such as leather or fur. Wayfair and Overstock are good sources to check out. If your sofa is on its last leg, an alternative to buying a new one is to reupholster the one you already have. Shop around and compare prices for fabrics and labor fees. If you’re a real daredevil, you could attempt to do it yourself as there are tons of tutorial videos on YouTube to assist you. I’m all about accessories so buy a few coffee table books from Amazon or Ebay and top it off with a tray for remotes and candles and any other knick-knacks such as a paperweight to spruce up the table. A gallery wall of artwork, shelves, and a large mirror placed behind the sofa will give your bare walls just what it needs. Allposters is a great resource for artwork and photographs. They carry framed pieces but I recommend framing the posters yourself because it can become a little pricey. Adding a large area rug will bring the room together in a more uniformed manner. Being that this is the area you host your guests, it is important to have entertainment nearby. A great addition to enliven things would be a bar cart that displays a variety of alcohol and wine. Incorporating candles and having a great source of music flowing will also add to the ambience of your space. I love creating an intimate atmosphere and I prefer to keep the TV off because there’s nothing like a night filled with good conversation and cocktails, unless it’s a designated movie night. Remember, the key to decorating is having proper storage so if you don’t already have one, purchase bookshelves and a media center to store your books and DVD’s. Target, Walmart, and Ikea carry reasonably priced shelving units. Any empty shelf space can be filled with more knick-knacks such as candles, picture frames, and vases.